2013’s total of 100 branches. PBB President and Chief Executive Officer Roland Avante said, “The bank’s long-standing relationships with the small-to-medium enterprises underpin our resolve to continue with the branch network expansion program. The bank’s branch network expansion has significantly contributed to the growth of the bank’s risk assets, a major strategic initiative highlighted by Mr. Avante when the bank was planning its initial public offering early in 2013. “When I met with investors while doing our IPO roadshows and company briefings, I promised to steadily grow the bank’s balance sheet to further improve our net interest differential business while supplementing it with trading gains. So far, we have significantly increased our presence in key strategic locations in the countryside where SMEs are operating, and the bank has steadily built the logistical support of late,” Mr. Avante added. core income more than doubled to ₱704.9 million from ₱332.6 million in the same period of 2013. The company’s core business of lending and deposit taking has delivered given the lack of sizeable leads in the treasury business. The bank’s loans and receivables increased 26% to ₱35.6 billion from ₱28.2 billion in September 2013. 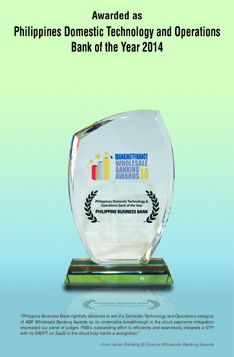 “The bank’s earnings have taken on a higher quality as our core income continues to develop. Our performance in 2014, in light of the challenges associated with a bank that used to derive a huge component of its earnings from trading, has been satisfactory. We believe that the bank’s earnings, now that it is primarily sourced from the traditional lending and deposit-taking business, has become more consistent and valuable,” added Mr. Avante. “In general, investors prefer assets that have recurring cash flows and high-quality earnings. With the continuing expansion of PBB’s branch network and the anticipated growth in interest-earning assets, the bank has shown that it can generate substantial recurring business by serving the needs of its key clientele,” said Dave Sison, PBB’s Head of Corporate Planning and Investor Relations. “We are committed to meeting the growing needs of our clients and one way of ensuring that we are available to serve them is by putting up distribution centers, via our branch network, in areas where they operate. The bank’s results in 2014 show that our strategy works, and we will work on building on the successes from last year. PBB has a significant number of approved but unutilized branch licenses from 2014, due in part to delays in building construction in sites already chosen and the lack of strategic locations, which is a key success factor in the viability and profitability of a branch’s operations. The bank expects to fast track the use of such licenses this year as we seek to strengthen our presence in SME-rich business centers both in Metro Manila and in leading provincial cities nationwide,” added Mr. Avante. The bank is also looking for potential acquisitions as part of its inorganic growth strategy. 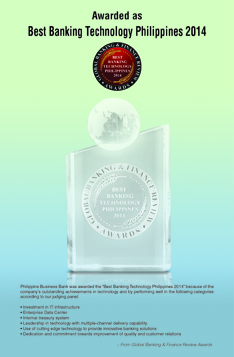 “At PBB, we will always look for ways to deliver adequate economic returns to our shareholders, and part of that strategy, along with strengthening our reach to the SME market by expanding our branch network, is to look for potential acquisitions that will accelerate the bank’s growth and coverage,” added Mr. Avante.